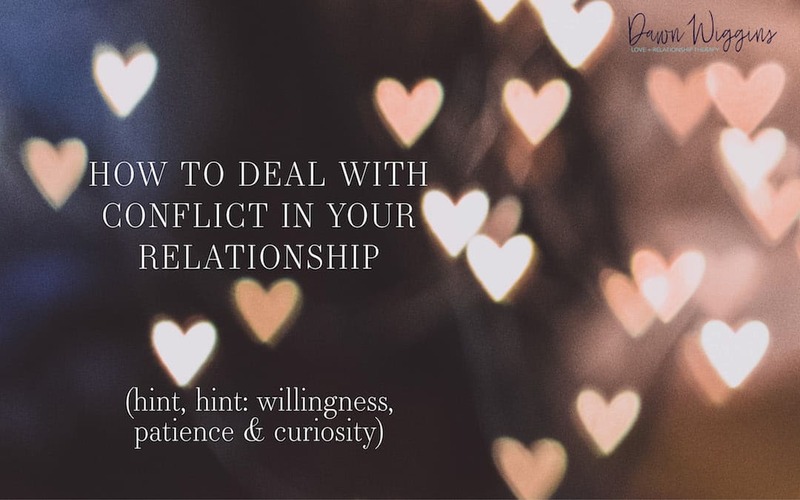 Wondering how to deal with conflict in your relationship? There are three types of porridge; I mean people (wink) when it comes to conflict. Those who are too hot and fight to win at all costs. Those who are too cold and avoid disagreements. And, those who have it juuuuust right and know when to confront and when to back it down. How to Deal with Conflict: Let Me Ask You, Are You Prioritizing Winning over Loving? I dabble in all three types of conflict – which I consider progress, because, I use to prioritize winning over loving. I’m going to share some insight into what motivates each type of conflict and how to have more productive engagement. High conflict folks are hot-headed, good with words and quick on their feet. Even when they aren’t rational, they will wear you down with their intensity and persistence. This person feeds on intimidating you. And, once they’ve met their goal, they may soften, becoming more approachable. The thing to understand is this person is genuinely fearful. Fearful of not having control and under all that noise, afraid of not being loveable. For your sake, don’t engage in debate with someone operating from this space. It can cause high stress, damage to the relationship and it will not lead to the outcome you seek. The best approach here is to take a break, remain compassionate and offer to talk more when things have cooled down. If you keep going without diffusing, the brain will send signals that it’s time for war. Aaaaaannd this is when the cops get called, which is not the outcome you want. Conflict avoiders: Known for “I don’t know,” shrugging or wanting to deal with it later. It’s not that they have no opinion; dealing with it feels overwhelming. Or impossible. Feeling anxious or entirely shut down are the two most chronic reasons someone avoids delicate topics. These folks are also struggling to feel good about themselves. They lack confidence in their ability to express themselves or that they will be truly heard. And, ultimately, just want to be loved and accepted. The best approach with an avoider is gentleness and patience. Focus on listening above all else. Conflict-free conflict is the subtle balance of disagreement, active listening, sharing and compromise. ability to chill out when things get amped. I listed willingness first because, without it, your dialogue will not be very productive. Two willing participants can move mountains if they use tools for healthy communication. This type of disagreeing creates connection and understanding. The key to effective communication begins with you. If you are reading this, you are on the path of willingness! Remember, communication is rarely improved by trying to force the situation. An open heart will resolve more conflict than anything else. For more info on resolving power struggle, check out my YouTube video by clicking here. And, if you’d like to receive weekly advice about relationships, be sure to sign up now to receive my newsletter.